The swamps of Africa can easily be described as inaccessible. The ground is soft, and people sink trying walk. The area is layered with vines and brush, adding more difficulty to movement. There are disease-harboring insects, and the locals do not welcome strangers. Why would any man travel there? To answer the siren’s call of the kongamato. Now you may be asking, okay Rebecca, who answered the call of the kongamato? Not all of these people went out specifically looking for the creature, but once presented with the kongamato, it became what their trip was about. The kongamato made its debut in Frank H. Melland’s 1923 book “Witchbound Africa”. He presented locals with a picture of a pterodactyl, which they immediately identified as the kongamato. In 1925 British journalist G. Ward Price and the future Duke of Windsor traveled to Southern Rhodesia. While there, they heard about local attacks made by the kongamato, stories that they shared upon their return to Britain. Captain Charles Pitman wrote in his 1942 book “A Game Warden Takes Stock” about a large pterodactyl-like creature that existed in the swamps. Dr. J.L.B. 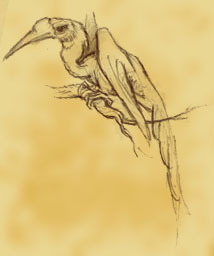 Smith investigated the kongamato in the 1950’s to include them in his book “Old Fourlegs” which was about flying dragons. In 1956 J.P.F. Brown, an engineer, reported that two prehistoric looking creatures were flying over head while he was in Northern Rhodesia. This was well publicized in the papers of the time. Obviously there have been more sightings and stories in and amongst all these times. That’s all history Rebecca, old news. Well is 1988 recent enough for you? University of Chicago biologist Roy Mackal was so intrigued by the history of the kongamato that he packed up and headed to Nambia in the summer of ’88 to investigate. He collected many stories while he was there, but unfortunately left without seeing one. One member of his group stayed behind, and he did report that he saw a giant black glider. After everything is said and done, there is no proof of the kongamato. No photos or specimens. Perhaps the kongamato is just a folk tale, something tribesmen tell each other about to keep them from wandering too close to the water at night. The African equivalent of the urban legend. It could be that it is, in fact, the lone surviving pterosaur. Will we ever know? Probably not. Will people keep looking? Yes, they will, and that, for me is the real story.